Throughout this tutorial I will be outlining how you can leverage the jQuery Interactions libraries to create more interactive and easy to manage admin areas and elements. We will start off with an explanation of what these interactions are along with a summary of the three main libraries we will be using; dragable, dropable and sortable. After we have covered the basics of these libraries I will show you how they can be used in a real world situation to extend your administration areas and create interactive zones. jQuery Interactions are a collection of different libraries that have been created to abstract away some of the fundamental difficulties of building interactive interfaces. These scripts are part of the jQuery UI (user interface) family and handle interactions such as dragging, dropping and sorting; with these libraries we can create complex functionality without the need of reinventing the wheel. 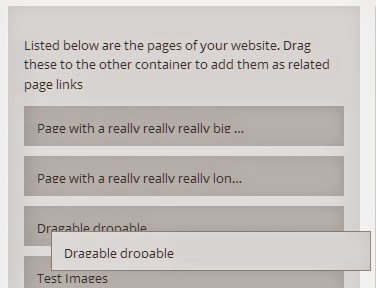 WordPress comes pre-intstalled with all of the interactions libraries (such as draggable and droppable). All you need to do is enqueue the required script on either the front end or back end of your site and you will be able to leverage the library however you want. WordPress often enqueues some of the interaction libraries in the administration areas. For example, when on the ‘widgets’ admin screen both draggable and droppable are already loaded (which provides the draggable interface for managing your sidebars / widgets) However it is often better to implicitly load the script you want just in case. You can enqueue the interaction library you want by hooking onto either the wp_enqueue_scripts or admin_enqueue_scripts hooks. These hooks will let you enqueue your script on either the front end or back end respectively. You will need to edit either your child theme’s functions.phpfiles or another location (such as your plugin file if you are writing a plugin) and hook onto the appropriate hook as displayed below. You will call the wp_enqueue_scriptfunction to load your script. Since we want to enqueue scripts that are preinstalled with WordPress we simply need to pass the correct name of the library (you can get a listing of all included scripts by going to the codex page for wp_enqueue_scripts). Create a function and hook it onto the wp_enqueue_scripts hook. Create a function and hook it onto the admin_enqueue_scripts hook. Enqueuing like this will let WordPress handle the loading of the library and all of its prerequisites (as most of the interaction library has several dependent files that it relies on). Overall the interaction libraries let you create interactions and movement with objects without having to do all of the hard work yourself. Explaining the libraries and all they can do is beyond the scope of this tutorial, however here are my thoughts on the libraries. Exactly as it sounds, you can create draggable movements and is often used to drag elements from one area to another (commonly between lists). The area in which your draggables will be dropped. There can be many areas you want to drop your things into, or maybe just one. Generally it is within the droppable API you move your items and do other actions (such as detecting when your draggable enters or leaves a correct area etc). This lets you easily move your items around without having to position them yourself. This is great for when you have a collection of items and their position is crucial. Let’s look at a scenario where you might want to take advantage of the interaction libraries to create dynamic useful controls for your admin users (or yourself if you manage multiple sites). Pages contain two areas that you can edit. The title of the page and the content of the page. While this is often all you need on your page, occasionally you might want to have additional information or functionality. For example, if you wanted the page to link to additional areas in a controlled way you would either have to use shortcodes at the bottom of your content area or you might have to use a special page template. What we can do is create new functionality for our pages that would allow the admin user to define links to other pages of the website. In this way the user would be able to manage links at the bottom of the page without having to edit the content area at all. Creating a drop and drag solution along with ordering would be perfect in this situation. In our scenario we will be expanding on our pages administration functionality; We will be creating an interface in which users can select additional pages to be linked to the bottom of the current page. This interface will be a simple drop and drag interface with the option to re-sort page links. We will go through each of these step by step, outlining what we need to do. Before we begin we will need to load an additional CSS and JS file for our custom styling and scripting respectively. These files need to run only on the admin back-end so you will need to enqueue these two scripts and styles to the admin_enqueue_scripts hook as follows. You will place all of your styling and scripting into these two files. They will be used in combination with the PHP code we will be writing. We need to firstly create a new meta box that will hold our related pages functionality. Start by creating a function and attaching it to the add_meta_boxes hook. Inside this function we will be calling the add_meta_box functionality that defines the new meta box, what post type it relates to and other associated information. Put the following code in your functions.php or applicable file. For additional information on the add_meta_box function you can view its codex page (to see how you customise various elements of the meta box). Now we define our function called display_related_pages_meta_box. This function will be used to display the meta box and as such it takes in a single value of $post. After we have the meta box set up we need to create a listing of all pages on the website. We need to collect all of the pages and then display them visually as block elements we can set as ‘draggable’ for our interface. Inside the add_related_pages_meta_box_to_pages function add the following code. Let’s break down what exactly we are doing here. We first set the nonce for the page (the nonce is a security method to ensure that when we submit forms we know it came securely). Check the wp_nonce_field function on the codex page. Overall the nonce will output a hidden input type with a value. The first argument is the admin name of the nonce and the second is the name that the hidden input will have (so it can be retrieved and checked later). We continue by collecting the meta value of related_pages into a variable. This is a post meta field that contains a JSON encoded string representing all of the related pages we want saved. We collect it now so we can use it later in our droppable section. We use get_post_meta to get the meta value by passing in the ID of the page, the name of the meta field and specifying true so that we return only one field. Have a look at the function definition on the codex. We are creating a listing of pages by supplying arguments to the get_posts functions (in this case it returns a listing of post ID’s representing the post). We loop through all of the pages and collect their ID and title. Using this information we create a page item with a data-page-id attribute corresponding with the page ID (this will later on in jQuery). We add the title of the page along with a remove button. We need to create an area for the draggable items to be dropped. Once items have been dropped here they can be sorted as we like. Go back to the add_related_pages_meta_box_to_pages function and look for the comment that says //end left container. We are going to add additional code after this comment, it will be right after the end of theleft_container but right before the clearix div and the end of the related_pages div. Let’s go through this code so you can see what we are doing. We create the right container to hold our sortable / draggable page items. We look at the related_pages variable we collected before which contains a listing of our already saved page items (on the first edit of a page or if we haven’t chosen anything this will be empty). If this variable is not empty we decode it using json_decode. This function turns a JSON encoded string value into an array so we can loop through each (look at the PHP documentation if you are interested). Now we loop through the related pages array with foreach and collect the ID representing the page. We in addition collect the pages name using the get_the_title function (view the codex for more information). For each of the related pages, we create a page item; this page item has the class page_item and also a data attribute called data-page-id that contains the ID of the page. Inside the item we specify a remove button (which will be used later so we can remove the item). Also inside the item we define the hidden field input that contains the value of the page itself. This will be the value that is passed to the form on submit (which we will then save). Notice that the name is related_pages with an . This is important as it means on the form when we process we will be supplying an array of pages. Finally, outside of the page item we create a droppable helper item that we will use to make dropping items into this zone easier (when you drag an item from the left container to the right container this will activate and will show you where you should drag the item). By this point we have created two containers, one for the listing of all pages and a second for where these pages will be dragged and sorted. Currently without the jQuery they won’t do anything. However, once you have this set up correctly you will be able to drop and drag items from the list into the other list and in doing so you will get a series of hidden inputs that will be passed on pressing save. This is where we need to define our saving function so that we can take these values and put them into a meta value. Copy the following into your functions.php file or similar. Let’s break down what exactly we are doing. Firstly we create a function called save_meta_information_for_page and attach it to the save_post_page hook. 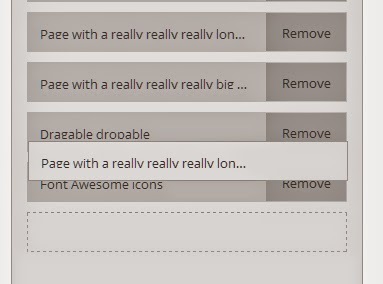 This hook will fire only when pages are saved / updated. You could use the generic save_post hook (and check the post type inside), however this newer action lets you target specific post types (learn about how to use it on the save_post codex page). Inside this function we perform security checking before we do anything else. We first test for the existence of the nonce and then verify to ensure it is correct (if it fails we don’t proceed). After this we check to make sure we are not auto-saving, we are only interested in full page updates via the save button. Finally we ensure that the user can access this page and edit it using the current_user_can function. This function determines if the current logged in user can perform certain actions. In our case if the user can edit the page they are refused (Read more about this on its codex page). Once we are sure that the page is secure we can begin our processing. We define an empty variable $related_pages_value that will be used to hold our related pages info. We check the global $_POST variable to see if any hidden input fields called related_pages have come through. If we do have them we assign them to a variable (which will come through as an array). We call the json_encode function to turn this array into a long string we can then save (take a look at the json_encode function if you are interested). As a last step, we call the update_post_meta function to save this newly created string representing our page values (check out the codex entry for this here). This will ensure that when we come back into the page later we can retrieve these values and automatically put them in the right hand column for our related pages. Overall you will need some basic CSS for this tutorial. Our system will consist of two containers, one for the listing of all pages and the other for our desired related pages. Inside these lists we will have page items that represent the page itself. 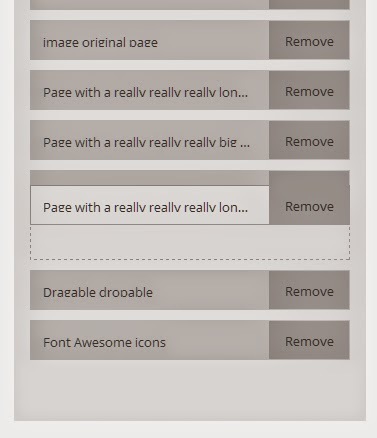 These items will have a name and a remove button (when they are dragged to the related pages area). Please go ahead and open up the admin CSS file you enqueued earlier called admin-related-pages-styles.css and add the following. On a side note, your styles and design can vary; feel free to change this to however you want (as basically all we are doing is adding items from one list to another). Now that all of the PHP has been set up we can look at the jQuery and how we intent to use the draggable, droppable and sortable libraries. First go into your admin jQuery file called admin-related-pages-scripts.js and add the following code. This document ready has been loaded in no-conflict mode. All of our code will go inside this function and attach to the $ item. The draggable library is extensive so please feel free to view the API for a full listing of its options, methods and events. The left hand side container has a listing of all the page items. When we find a page we like in the left hand side container, we will drag it to the right hand container. When dropped the item will be copied into this list, ready to be sorted and saved. We begin by finding the left_container item and its inner items called page_item (which as you remember are items representing each page). We call the draggable function (which is part of the draggable library we enqueued previously). This function takes several options however I have specified just a few to get the functionality I wanted. When you have this set up you should be able to drag your page items around. The droppable library is extensive so please feel free to view the API for a full listing of its options, methods and events. The right hand side container is where we will be dragging all of the page items. Each item will be dropped here and then later sorted in the desired order. Start by adding the following code. We start by finding the right_container and then calling the droppable function on it. This function has several options and methods, some of which I have defined below. hoverClass – ‘hover-over-draggable’ is the class name that will be added to the right_containerwhen we have a correct draggable hovering over the container. This will let us do things such as highlighting the container or enabling helper units. tolerance – ‘touch’ means that as soon as the draggable touches the droppable area it will be able to be dropped (by default most of the item has to be inside the area to drop). This is mainly a look and feel things. This function has access to the ui item, which contains the reference to the item being dragged. We collect the page item being dragged into a local variable by cloning the draggable. We find the droppable-helper inside the droppable list. Now that we have access to a copy of the draggable we add a new hidden input field inside of it and supply the page ID by using append. We get the droppable-helper item and insert our chosen related page before it. The whole purpose of this droppable is to take the draggable, inject the value of the page item into it and then append it to our related pages list. You should be able to expand on this to make it as fancy or complex as you want. The sortable library is extensive so please feel free to view the API for a full listing of its options, methods and events. Now that we can move items from the left container to the right container, we can start sorting the right container (related page items). We start by finding the right_container again that contains our related page items. We then call the sortable function and define options. placeholder – ‘my-placeholder’ is the CSS name that will be used when sorting the item. When you sort an item the sortable plugin will add a temporary item into the list of items. This temporary item will move the other items up and down. For this tutorial I have supplied styles so that it will look similar to the droppable helper so you can see the sorting. We also need to add a function to remove an existing page item (for example you may have dragged over a page but now no longer want it). Add the following to the bottom of your JS file. Now that we have the related pages saved to a page, we can create a function to show these pages at the bottom of the applicable page. Let’s break down what we are doing here. We firstly create a function called display_related_pages_information and add it to the the_content filter. This filter will give us access to the content section of the page (we will be placing our related pages after the main page content area). 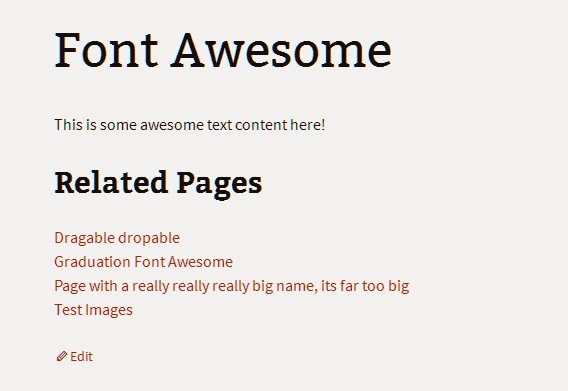 We will have access to the $html item which contains the html for the content of the page. We will be adding our output code onto this. We get the global $post item and then check to see if the post type is page. If we are on a page we will execute our related pages output. We get the related pages from the meta value related_pages and if we have set pages we begin the output. We create an article and a header and then for each of the related pages we collect collect their ID, name and permalink. With this information we create a simple link to the desired page. We return the $html variable at the bottom of our filter and when we view our pages, if they have associated related pages they should look similar to the following. The great thing about this is that you don’t need to edit any template files and the related pages will only be shown if they have been set. Hopefully, by now, you have a much better handle on the complexities of the jQuery Interactions libraries, and how to create more interactive and easy to manage administration functions, particularly when it comes to the three main different libraries: dragable, dropable and sortable. Please let me know if you have any comments or queries below. Full stack developer and overall web enthusiast. I love everything to do with web / design and my passion revolves around creating awesome websites. Focusing primarily on WordPress, I create themes, plugins and bespoke solutions.